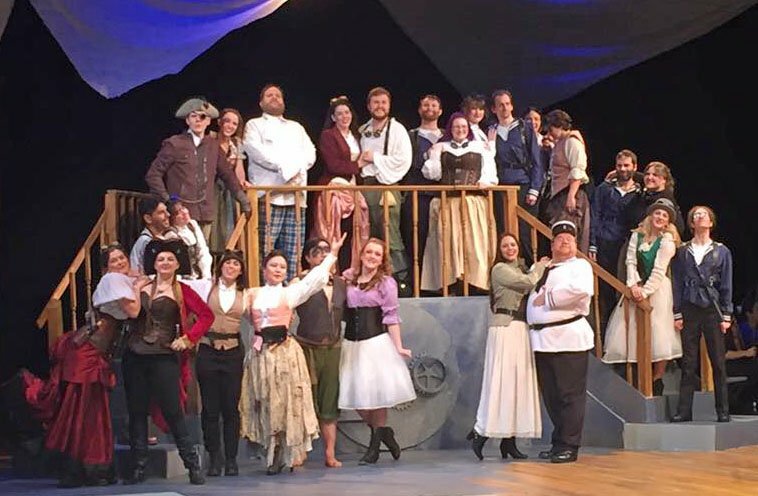 For its current offering, MITG&SP is turning (performances, at MIT’s Stratton Student Center, continue next weekend) to one of the most popular of the canon, The Pirates of Penzance; or, The Slave of Duty (premiered in New York on New Year’s eve 1879). Does one really need a synopsis? If so, check it out here. As with several other G&S operas, notably Patience and Ruddigore, the satirical target here seems more literary than social, namely the mid-19th century fascination with romanticized pirate tales (the title itself is satirical, since nobody would have associated the tranquil Cornish resort of Penzance with buccaneers); but Gilbert turned his sights on numerous other targets, including a favorite jab at military-political authorities who know virtually nothing about their ostensible subjects of expertise. For his part, Sullivan took aim at various opera composers, including Verdi, Gounod and Donizetti, though these specific parodies are easy to ignore in the midst of Sullivan’s brilliant and original contributions (does one really think of Il Trovatore any more when listening to “Come, friends who plough the sea”?). It took much longer for producers and directors of G&S to succumb to the time-shift mania that has totally overwhelmed Shakespearean productions, but succumb they have. Producer-Director Emma Brown has conceived an ostensibly “steampunk” version of Pirates, in which the pirates are vaguely like World War I pilots, in leather helmets and Technicolor goggles (or, in the case of Nick Stevens’s Samuel, an eyepiece crossing a Borg with a jeweler’s loupe). This is probably not an accurate rendering of steampunk esthetics, but you go with what you’ve got. The aviators are in pursuit of the Major-General’s daughters, who are designated merchant marines (chief attribute: boots). The latter, in act 2, are assisted by a band of hired mercenaries, who mercifully do not declare that a Merchant Marine Hired Mercenary’s lot is not a happy (sorry, an ’appy) one. There is one significant gender-bend, in that Elyssa Bjorkman, a MITG&SP veteran, was (delightfully) cast as the Pirate Queen. Would only that her first aria had been ever so slightly rewritten to “It is, it is a glorious theen/To be a Pirate Queen.” It is, however, a glorious thing that the diction of Bjorkman and the chorus was good enough to make it clear that they didn’t. Kudos to Vocal Director Sara Haugland. A much more congenial alteration for this production was a “theater in the round” (well, in the horseshoe) staging that provided a large central floor-level stage, on which Brown ably deployed her forces, with great skill at massing and moving players and using distance for dramatic purposes. The set was quite rudimentary, just a low platform at one end and a three-way staircase at the other with a clever porthole-shaped hatch with many gears (which in proper MIT fashion all intermeshed perfectly for opening and closing the hatch). The gear concept was replicated in lighting that illuminated the stage floor during intermission, perhaps the only instance of a G&S opera with a light motif). The orchestra arrayed itself at the open end, around the corner of the room, where things seemed less cramped than in prior productions where they were packed alongside the stage. The performances were mostly all of a high caliber. Tenor Tim Ayres-Kerr was an effective and not at all alarming Frederic, the titular slave of duty whose imbecilic consistency displays as farce what George Santayana’s Last Puritan conveys as his protagonist’s tragedy of class obligations. He sang with purity and conviction, enunciated perfectly, and acted without a touch of guile. Mabel, in this performance sung by understudy Elizabeth Sterling, was likewise in solid control of the remarkably wide-ranging part, from coloratura for “Poor Wand’ring One” to near alto range for “Leave Me Not to Pine,” arguably Sullivan’s most beautiful melody. Anyone who saw a different performance should let us know in the comments about the “regular” Mabel, Meghan Jolliffe. As noted, Bjorkman’s diction was superb, but her jaunty swash buckled well, and though her puff couldn’t be compared to Ethel Merman’s, there was plenty of force, both in her introductory aria and in the wonderful “Paradox” song in Act 2. There were surprisingly strong turns from two of the lesser singing roles, Nick Stevens as Samuel and Alyssa Koogler as Edith. Rebecca Wright as Kate and Cynthia Goodman, as Isabel, two of the daughters with smaller parts, were able though a bit wan. Jeremy White’s Sergeant of whatever he was sergeant of made up in acting what he lacked in vocal production (it’s really a deep bass part, and his instrument just doesn’t go that low). This leaves three other performers for whom to account. Mike DeFillippi, as Major-General Stanley, is gifted with the most famous song in the opera, “I am the very model of a modern Major-General,” and also stuck with possibly the worst one, “Sighing softly to the river.” The challenge in the former is to spit out all the words intelligibly at pitch and as fast as possible, and at the same time convey a totally unself-conscious admission of ineptitude. DeFillippi achieved the first (including all the right notes, which the patter baritone doesn’t always pull off), partly at the expense of the second, and did the third pretty well. In the latter song, the challenge is to carry the lyric tune at a pitch that is at the extreme upper end of a baritone’s range (this we know from experience) while bounding about the stage among “concealed” police and pirates (excellent stage business in this scene, by the way). In this respect DiFillippi over-extended himself, but his acting skills carried him well along. The conductor for this performance was the Assistant Music Director, Elena Sokoloski, a Harvard undergraduate who has played in the orchestra but whose bio does not reveal prior conducting credits. She carried off her duties efficiently and gracefully, though we found the overture a bit on the slow side. The balance of orchestral forces was good, and with a couple of slips in the second act, kept on top of the vagaries of the singers. Saved the best for last, we did. One of Gilbert’s great contributions to the theater was his creation of wonderful roles for “difficult” older women, geared to the personalities and performing strengths of a remarkable roster of actresses, some of whom the writer discovered, all of whom sang in the mezzo-to-contralto ranges. These are the most rounded, most complex, and most human roles in the operas (the apex of which was Katisha in The Mikado). The first, Lady Sangazure in The Sorcerer, blossomed into Little Buttercup in H.M.S. Pinafore, but this category increased its psychological depth with Ruth in Pirates, going from blowzy nursemaid to stoic maid-of-all-work to spurned and panicked supplicant for Frederic’s affection to embittered pirate and, at the end, sly-boots savior of the crew. Anna-Constantia Richardson was, simply stated, one of the best Ruths we have seen, whose gestures and expressions went with each of these developments, who sang powerfully and accurately, enunciated clearly, and acted up a storm. Numerous felicities in the stage direction that we haven’t yet mentioned include the perfect resolution of the troublesome fight scene between pirates and police that has to be over in a few beats, and the imaginative staging of the hiding that precedes it—on a stage bare of relevant props or scenery. The lighting, designed by Tom Ostrowski, didn’t shoot for virtuosity but always achieved appropriateness. Continues on Thursday and Friday evenings and Saturday afternoon, details here. Vance R. Koven studied music at Queens College and New England Conservatory, and law at Harvard. A composer and practicing attorney, he was for many years the chairman of Dinosaur Annex Music Ensemble. He is the father of the publicity and ticket manager for this production. In fact, there were no small actors in this production – it was full of vital people, for whom the audience could care as individuals… bravo to director Emma Brown for inspiring her cast!